FREE battery case with each pair of batteries purchased. You must carefully read, and comply with the safety instructions and precautions in this Safety Instructions guide before charging, using your battery. Failure to read, and follow Li-ion safety instructions, and warnings may result in fire, personal injury, and property damages if the battery is charged and/or used improperly. DO NOT SHORT CIRCUIT. Short circuits may cause a fire and injury! Charge battery fully to 4.2V before first use. Use high-quality charger specifically designed to charge Li-ion batteries. Always keep your battery that is not in use inside plastic battery holder or any plastic insulating casing. Do not keep a bare battery in your pocket, purse, or anywhere together with other metal (conductive) objects. Never attach any metal moving part |magnet| to the top positive or the bottom negative battery contact. Stop using the battery with damaged PVC tube (wrap) or terminal insulator immediately. If the battery is damaged in any way stop using it immediately. 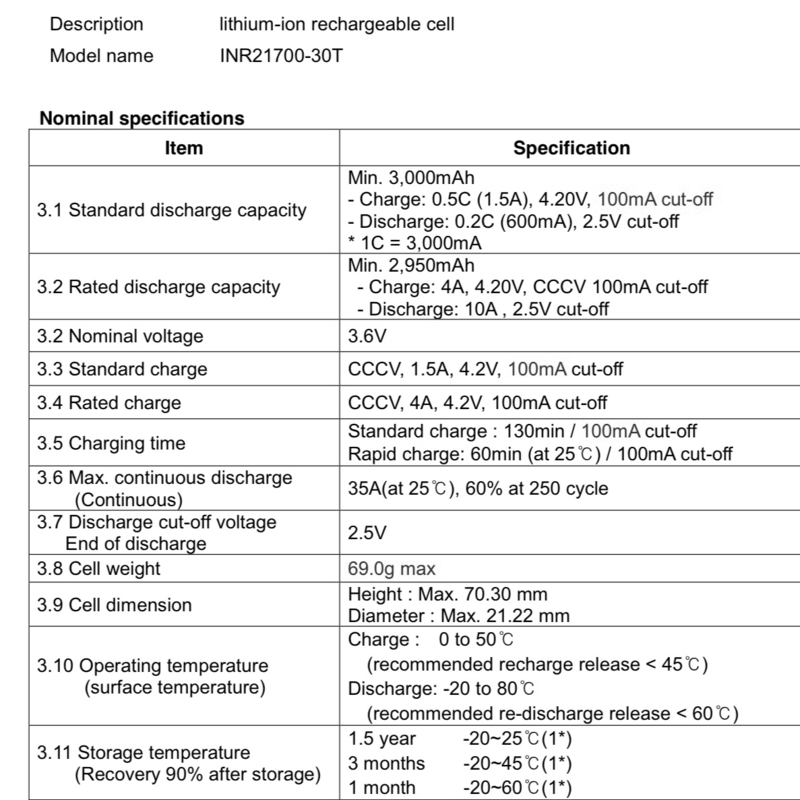 Never discharge a Li-ion battery at a rate exceeding the maximum discharge current specified for that battery. Do not use old, and new batteries together. Do not solder directly onto the battery. Do not immerse in any liquid. Do not drop the battery. Always keep it in a plastic protective holder. Do not place the battery in high-pressure containers, microwave ovens, or on induction cookware. Immediately discontinue use of the battery if, while using, charging or storing the battery, the battery emits an unusual smell, feels hot, changes color or shape, or appears abnormal in any other way. Do not carry, or store the batteries together with hairpins, necklaces, or other metal objects. Use only high-quality battery Li-ion charger (CC/CV 4.2V max). Do not disassemble, or modify the battery. Keep the battery away from children, and pets. Never charge, or store the batteries inside your car in extreme temperature. Extreme temperatures (low or high) might ignite the battery, and cause a fire. Do not short (connect) positive, and negative battery terminals (contacts) intentionally, or unintentionally. Never charge the battery over 4.25V (properly charged li-ion battery is 4.2 Volts / full charge). Do not reverse the positive (+) and negative (-) terminals when charging, or using the battery. Never charge the battery at a current exceeding manufacturer-specified charging current. Do not expose the battery to water or salt water, or allow the battery to get wet. You must verify polarity before connecting the battery to the host device (or charger). Never completely discharge the Li-ion battery ( below 2.5V under load ). After the battery is discharged-don't leave it discharged-charge battery as soon as possible (10 min. rest time). It is your responsibility to determine that your charger and host device works properly. On (battery electrolytes) exposure to skin, flush with water immediately. If eye exposure occurs, flush with water for 15 minutes, and seek emergency care immediately. The situation when battery positive (+) and negative (-) connect. The current will become extremely high because there is no resistance in the path to limit current flow. This Short circuit will result in dangerously high temperature which may cause a fire. Free battery case with each pair of batteries. Price listed is for one battery cell. We ship very fast from Florida -USA. ONE Samsung 30T for sale. One (2x21700) battery case / holder included with each pair of batteries. If you order 2, 4, 6, 8, 10, 12, 14, 16, 18, 20 Samsung 30T = All batteries will be inside plastic protective cases-containers (2 batteries in each case). If you order 1, 3, 5, 7, 9, 11, 13, 15, 17, 19 Samsung 30T = All batteries will be inside plastic protective cases-containers (2 batteries in each case), and one battery will be without case.